Well, we just got done with three messy baths, and the house is still in need of a good scrubbing, but I think it was worth it. We spent the morning digging in the dirt and mud for the plastic play food pieces that I buried in the garden. I let the girls loose with spoons and shovels to find the food with instructions that the items worth the most number of "points" were the pieces of healthy food. They aren't old enough to keep track of points for a real competition yet, but they enjoyed finding things and asking, "How much is this worth, Mom?" If it was a piece of pizza or a can of processed food, I might just say, "One point." But green leafy vegetables were worth 3 or 4 points. They definitely did NOT find every piece of food I hid. (I often overestimate toddlers' and preschoolers' finding abilities.) I do believe we're going to be digging up plastic potatoes and carrots along with the real ones when our next garden harvest comes in! When a bouquet starts going south, get a little educational enjoyment out of it by lining up patterns of flowers. Let your child discern the patterns and place the next few flowers in each row. 3. 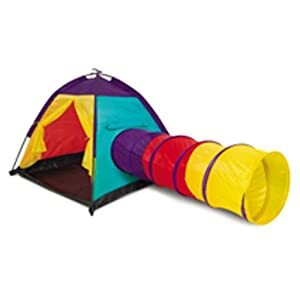 2pc Adventure Play Tent Kids Dome & Children Tunnel Tube- This set gets pretty low reviews on Amazon, and I guess I understand why. It is a little cheaply made and has gotten some holes pretty easily, but the girls have gotten LOADS of fun out of it- especially the tunnel- which they've put to all kinds of unconventional uses. If you can find a comparable item that is of a little higher quality, that might be the way to go. 4. 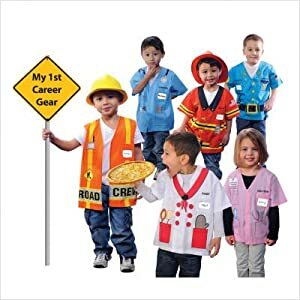 Dress-up Accessories- We don't own this exact set; so it's not really a recommendation, but it fits what I like in dress-up sets- lots of smaller accessories that can be combined in creative ways (rather than a single, expensive outfit that really only has one particular use). 5. 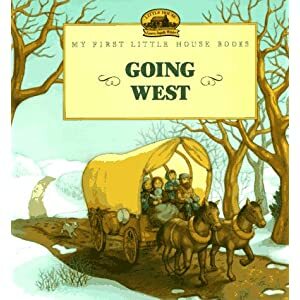 My First Little House Books- Our favorite series of picture books (based on the original series by Laura Ingalls Wilder, but simpler language). I think the words and pictures keep the same spirit as the original books. We've read each book over and over again. I think our favorite so far is Going to Town. 6. 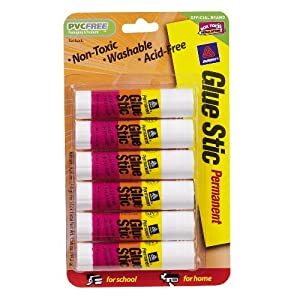 Glue Sticks- seriously. What craft supply gives more joy to a toddler or a preschooler and is in more need of constant replenishment? 7. 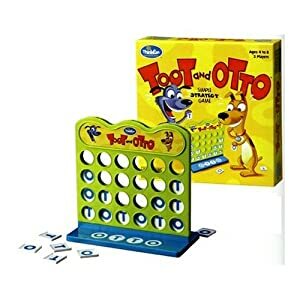 Toot and Otto- like a simplified version of Connect Four with several versions of play for different levels. My two-year-old regularly begs to play this game (I think she mostly likes the feel of the tiles sliding in and out, but she's starting to understand the object of the game more and more). 8. 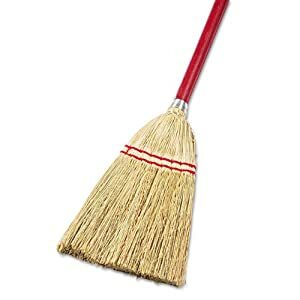 Child-sized Broom- We discovered what a wonderful thing this was when we visited my aunt and uncle who happened to have one. M used it lots. After we left, she talked about it as if it were the highlight of the trip. And of course, what parent can resist a toy that helps make their child want to clean? 9. 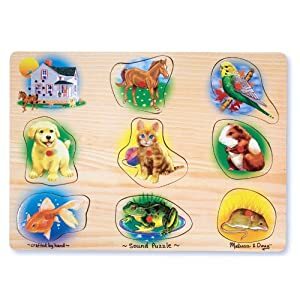 Melissa and Doug Pet Sounds Puzzle- Just about all of Melissa and Doug's wooden puzzles are wonderful, but this one is probably our favorite. 10. 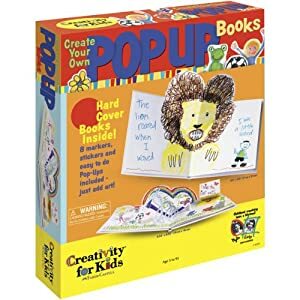 Create Your Own Pop-Up Books- This set really more for older kids (especially six through nine- year olds); so I've saved some of parts of the set for the girls for later, but M loves the interesting little books she's been able to color and put together already. I've also learned some fun things from the set on how to create my own lap-book mechanisms for homeschooling. 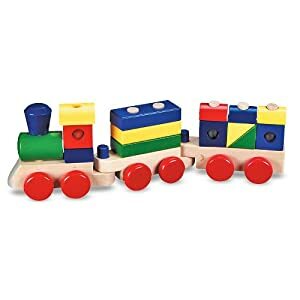 I'd love to get some ideas from you about long-lasting toys, games, and books around your house. Please share! I hope you have a wonderful day with your family today and enjoy the Lord's goodness together! In theory I love Thanksgiving. But to be perfectly honest, the days and hours leading up to the Thanksgiving meal often find me busy and not terribly thankful (ironically, even a little irritable and grumpy). This year we had our big meal on Wednesday; so today I decided to try to make a concerted effort to think thankful thoughts while I was making the meal and cleaning. I wasn't completely successful (there was that string cheese emergency, for example, when I had to quick eat a piece of string cheese before I bit my husband's head off) but there were some moments of reflective thankfulness. And what was interesting to me was that I found new things to be thankful for that I probably would not have noticed before. 1. All the interesting textures God has made. The firm but slightly spongey potato in my hand, the clammy turkey skin, etc. It really is beautiful and amazing. 2. That none in my immediate family work retail. We don't have the stress of Black Friday, etc. ahead of us. 3. Ready access to so much meat when so much of the world struggles to get enough protein. 5. That all this busyness comes from people. I'm so glad I have people in my life for this Thanksgiving. It would be hard to be alone. 6. For convenience foods. I feel a little strange being thankful for this because theoretically I'm a bigger fan of cooking from scratch, but what a luxury to be able to choose not to- when time is tight or when one just really doesn't care that much about a particular dish. It's a boon to live in the age of Stovetop Stuffing! 7. That if I stopped cooking and cleaning right now, we'd still eat better and in a nicer home than two thirds of the world. Everything I am doing right now is over-the-top, luxury bonus. ( Took a little of the pressure off, besides being a reason to be thankful). Have you found new things to be thankful for this year- maybe things that you've had all along, but have just now struck you in a new way? Free Fun in Austin today is hosting a collection of some of our favorite simple fall activities 10 Simple Fall Actvities for Kids. My fall leaf puzzles also featured today on OrSoSheSays. Check out their fun, idea-filled site! All in all a great (and easy) fall project! 1. Peel and core some apples. 2. Place each apple on a swatch of pie crust big enough to wrap the apple. 3. Let each child stuff their apple with bits of cold butter and cinnamon sugar. 4. Have them wrap their apples in the pie crust like a present. Make sure that the apple is completely covered and there are no holes. 5. Mix an egg white with a tablespoon of water and let your children brush on the glaze. 6. Bake on a greased, tin foiled baking sheet at 350 degrees for 40-45 minutes. Yum! Like tasty little apple pies! My husband loved them too! I really like finding new ways for the girls to send get-well wishes to sick people that they know. So good for them to be thinking about other peoples' struggles. When I saw this post about sending long-distance Valentines hugs on Pinterest I thought it would be a great concept for get-well cards too. The ribbons between the hands are measured to the lengths of each of their hugs. What other ways have you found to help your kids send cheer to sick people? 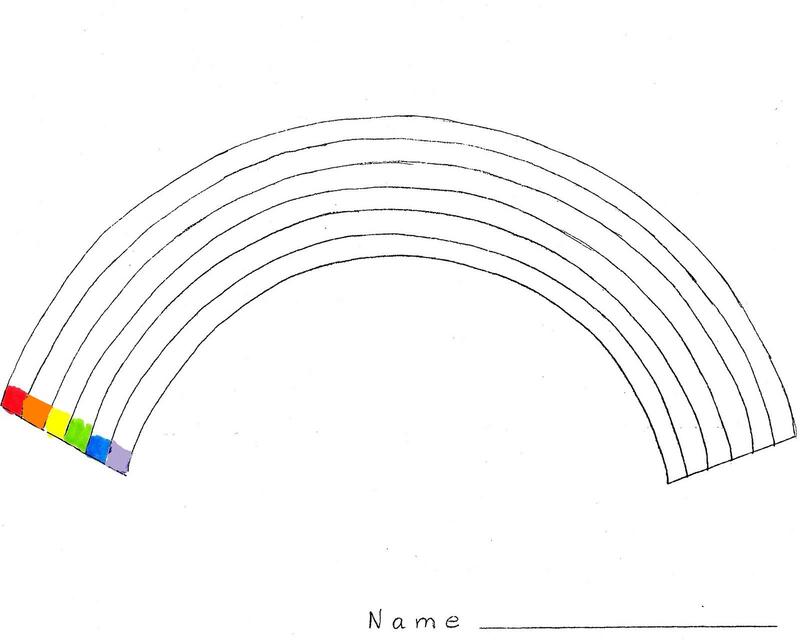 Players take turns rolls a die with the colors of the rainbow on it; whichever color turns up, the player gets to fill in that color on their rainbow. 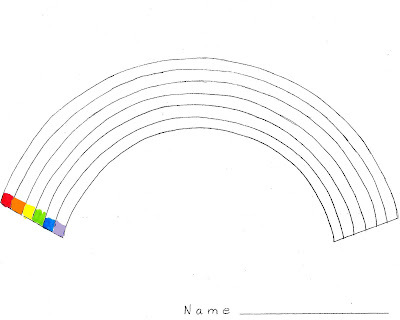 Whoever fills in all the colors on their rainbow first wins. This activity only worked so-so. I colored the sides of a die with dry colored dry erase marker. As you might imagine, the colors rubbed off after a while. I think it would have been better just to paint a die with acrylic paint, but for some reason I didn't have any red; so we did it this way, and it worked ok. I suppose instead of using a die, you might put various colors in a bag, and let each child take turns reaching in to draw out a crayon. The Activity Mom did a similar activity recently, but her version is a little more educational. You can check it out here. 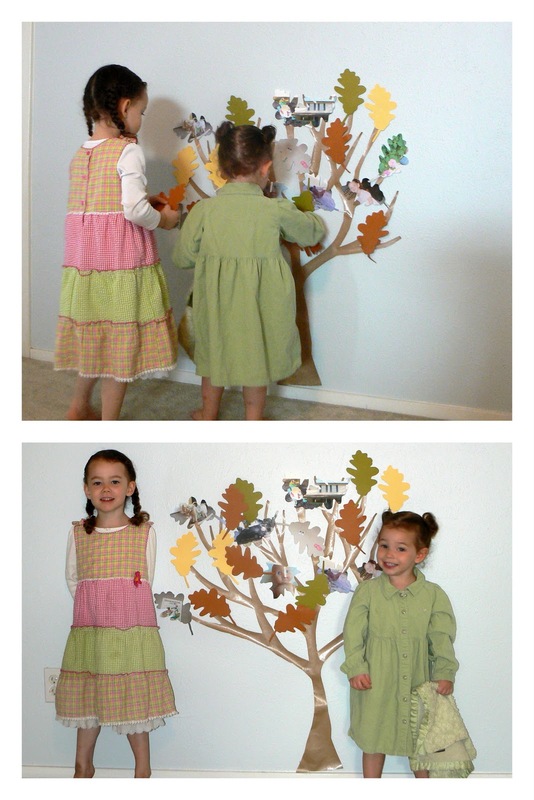 I decided we would try to make a pictorial Thankful tree this year while the girls are little. For the last few days, I've been asking them to think of things they are thankful for and then giving them the camera to take pictures of their answers. My favorite so far is this leaf. So when I remembered that unopened package of finger paints that craftprojectideas.com had sent me a while back, I felt a little tempted to send it back into hiding. But then I remembered a fun idea I had seen on someone's blog a while back (can't remember who- sorry!) about using finger paints to make symmetrical squish paintings. I got out the popsicle sticks and we dabbed blobs of finger paint onto the middle of a piece of paper. We folded the paper and SQUISHED (definitely the fun part). When we opened up the page, we had the fun of figuring out how to turn the shape into a monster. I gave the girls googly eyes to put on where they wanted, and they instructed me as to where to draw details on with a marker (ears, feet, hands, horns, etc). Much less mess than finger painting- and not without imaginative and sensory appeal! 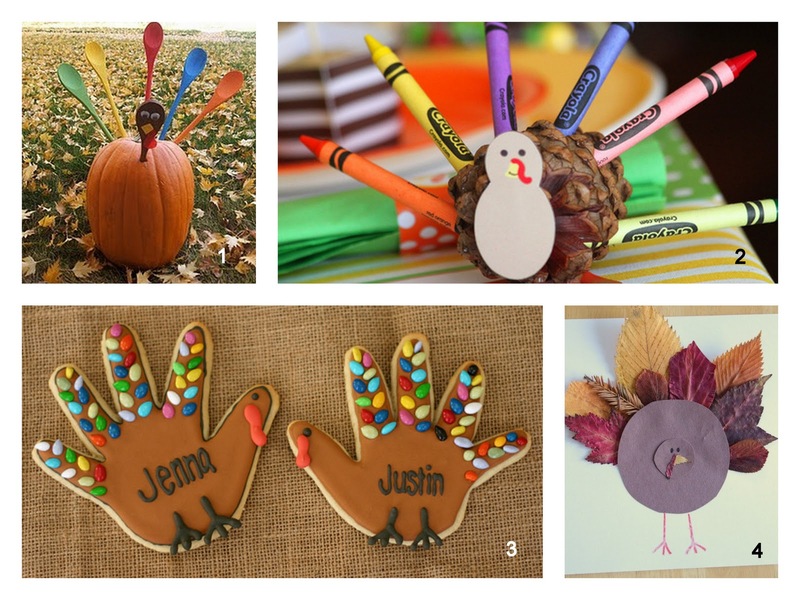 Maybe your taste in turkeys runs differently than mine, but I think all four of these turkey ideas are really, really fun! 2. Pinecone Turkey from Amanda Parker and Family. I love the crayons as the tail! This is Annie. She took a little trip down the story road today. She hopped from book to book as we told a story about her, each aspect of the story relating somehow to the book she was on. The book paths forked and combined at various points so the author could decide what kinds of things they wanted to include. For a while now I've felt a little guilty about not better utilizing these fabulous animal track rubber stamps that my mother got for the girls a while back. It's just been so hard for me to get excited about the combination of ink pads and toddlers. Paint is a little better, but still messy. Yesterday I was so tickled to find a low- mess way to use them. They work great with play-doh! Even little G can get fun effects with them with no help. 3. Cumulus- equal parts shaving cream and glue. It dries fluffy and textured- really fun! I want to extend a hearty welcome to all those visiting from my guest post at one of my all-time favorite blogs, Money Saving Mom! I really love Thanksgiving. Among the holidays, it's one that is relatively untainted by commercialism. The grit of the Pilgrims is inspiring, and being deliberate about thankfulness to the Lord as a family is so potent. Plus, because it's not an explicitly religious holiday, I don't feel like it is being irreverent to indulge in some of the fun and silliness that surrounds it. All that combines to make it one of the holidays that I'm really willing to invest time and energy into making special. 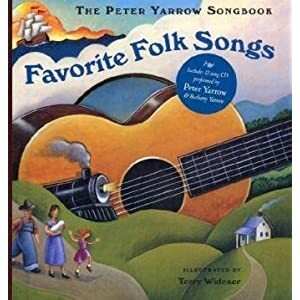 Here are three of my favorite Thanksgiving books. 1. Most Beautiful Artwork: N.C. Wyeth's Pilgrims by Robert San Souci. The illustrations in this book are out- of- this- world gorgeous. 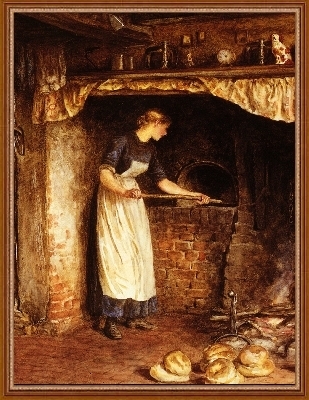 Instead of the typical, artificially manufactured fare that you usually find in children's books, these pictures come from art that stands on it's own merit. 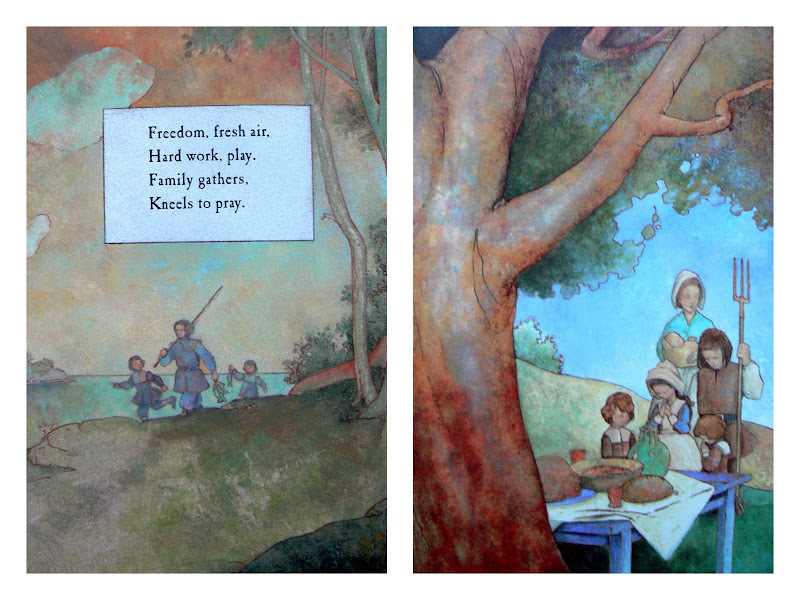 They are based on a series of murals painted by N.C. Wyeth for The Metropolitan Life Insurance Company in New York in the 1940s. I love the play of light and color throughout the book, and I appreciate the way the depiction of the pilgrims challenges the typical conception that they were dour and stiff people. 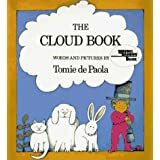 Lots of life and joy in this book- without being saccharine. The author consulted many sources for making text, and the writing is just fine. (although, really better for older children. My little ones just look at the pictures for now). 2. Best Text: Tattered Sails by Verla Kay. The illustrations in this book are rather good too, but it is the text that really stands out. Tattered Sails tells the story of a Pilgrim family's difficult voyage across the Atlantic (not necessarily the Mayflower, but it could have been) and ends with their thankfulness at settling into life in the New World. Verla's Kay's writing style is impressionistic. Instead of straightforward prose, she uses short staccato phrases strung together to paint a poetic picture of life during that time, and I think it really works. Our family have several of Kay's history stories, and we read them over and over. It's rhythmic without being trite. 3. Most Fun: Blue Hat, Green Hat by Sandra Boynton. This isn't necessarily a Thanksgiving book, but it's about a silly turkey, and it's humor is just right for toddlers. So fun! I was going to write today about our thankful tree plans for this year, but I'm afraid time has gotten away from me this afternoon, and I don't have a picture ready to go with it. Instead, I'll just show you what we did this morning for G's school time. 1. Six sticky notes lined up and numbered one through six. 2. Six more sticky notes- each with a letter of G's name spread out randomly on the table. 3. We sang the silly little song I made up to help G remember how to spell her name. As we sang each letter, I asked her to find the corresponding sticky note. 4. I instructed G to put the sticky note letter on the correct numbered sticky note. What other activities have you tried to help your child learn how to spell his name? 2. 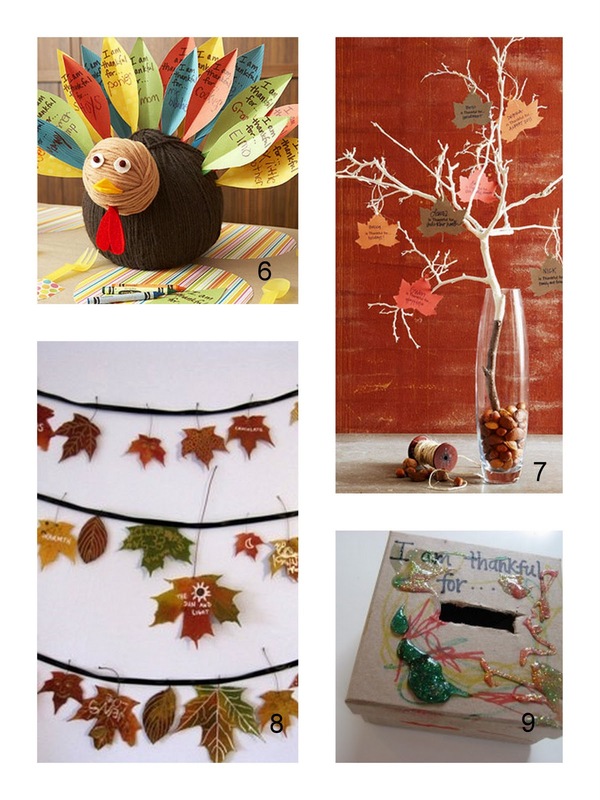 You could make individual thankful trees out of paper towel rolls like they did at Motherhood Moments. 3. Scrap the tree idea entirely and go with an erasable blessings board. The tutorial is at Less Than Perfect Life of Bliss. 4. 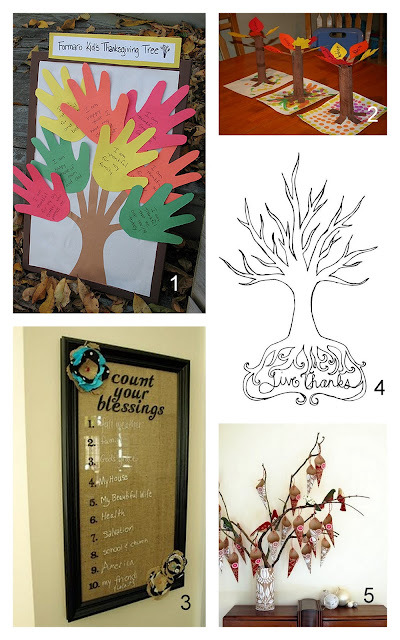 I love this artfully done printable for a thankful tree. 5. The Red Thread came up with the idea for this reverse advent tree. Each day her family filled it with something that they are thankful for. 6. Parent's Yarn Thankful Turkey is so cute! 8. 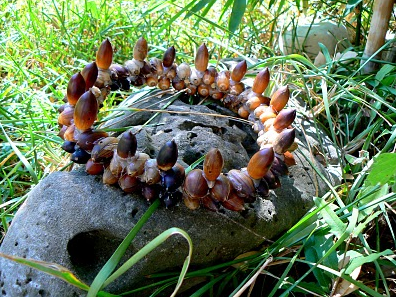 The Artful Parent shows you how she made her pretty leaf garland. 9. This child-decorated thankful box is a good idea from No Time for Flashcards.